So many World War II books, not enough hours in the day to look at them all! Do you ever feel that way? 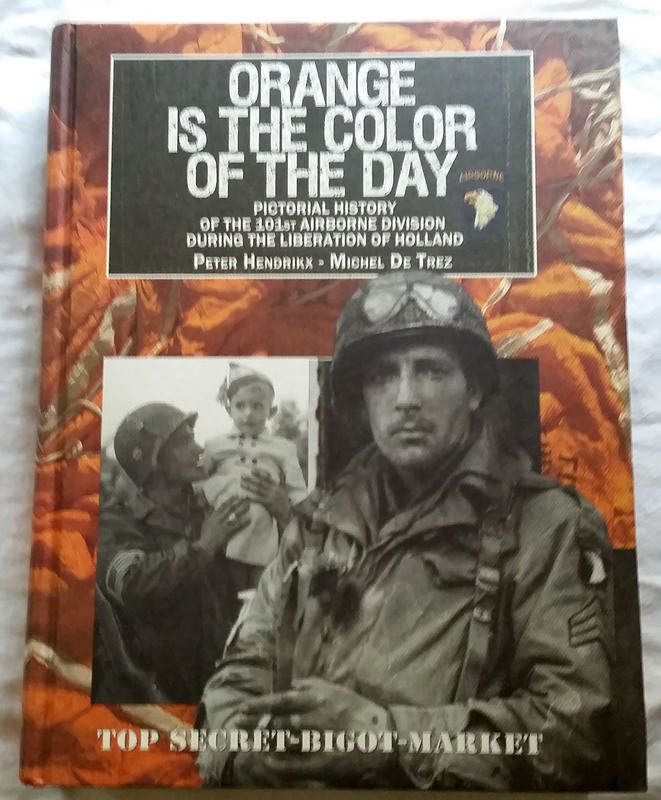 If you are interested in the history of the Airborne in Holland during World War II, the book Orange is the Color of the Day. Pictorial History of the 101st Airborne Division During the Liberation of Holland by Peter Hendrikx and Michel De Trez, is a must have book! The author, Peter Hendrikx, from Eindhoven, explains his fascination with the 101st Airborne, which began with some photographs his father took during the war. Over the course of his life, he began researching more and searching for one photograph which was lost after the few photos his father took were submitted to a newspaper for printing with a war dairy. After connecting with Michel De Trez, a 101st photograph expert, he was eventually able to find a copy of the lost photo. This began a journey into documenting the story of the Liberation of Holland for these two men. The book contains a lot of history of the Airborne taken from books written by veterans, some 101st Airborne Historians, and other sources. There is no bibliography of sources used, but each paragraph or photo has a short citation. I’m guessing if one really wanted to know more, they could contact the authors and inquire. The book is over 555 pages and contains hundreds of photographs. All the photographs are sourced, most being from personal collections. A few from Army Signal Corps photos. Unfortunately, the Army Signal Corps photos do not have any reference number so a researcher could go into the National Archives to view them with others taken at the same time. The photographs are not small, but take up 1/4 – to almost an entire page. The book itself is over a foot tall and slightly less wide. There are views of soldiers walking through towns, Dutch citizens welcoming liberators, German prisoners, maps, and more. If you are searching for an incredible resource for the 101st Airborne, you should check out this book. What great pictorial histories about World War II have you read and can recommend to our readers?